Genetic bases for siblings to ensure they are not treated alike has fallen to research, says S.Ananthanarayanan. Species sometimes go lengths to look like another, so that they deceive predators. Duke University graduate student Robin Hopkins was working with the contrary feature -instances of the same plant species making arrangement to look different, so that butterflies think they are not the same plant and they breed separately. Robin Hopkins has only just finished defending her doctoral thesis and her paper, written with Duke University professor Mark Rausher, has appeared in the journal, Nature. When some individuals of a species happen to resemble similar looking species, which is distasteful to or feared by predators, these ‘imposter’ individuals borrow protection and enjoy a survival advantage. The genetic feature which causes this resemblance is then selected and stabilises. This form of mimicry, which is called Batesian mimicry, after its discoverer, Henry Walter Bates, is seen in several butterflies and reptiles and is the most common form. Another form of mimicry is Müllerian mimicry where species which have their own individual means of protection, still converge, although partly, for mutual benefit. Yet another form is where a harmful species disguises itself as a harmless one, both to avoid conflict as well as to sneak up on unsuspecting prey. These are all instances of different species trying to look alike, the converse of what Robin Hopkins’ work, which is on individuals of the same species trying to look different from their brothers and sisters, so that they can breed and hence evolve along a different direction, to grow as a different species. Growth of new species from a parent species is nature’s method of adapting to changing environment and distributing the demands on the environment, so that the species could be sustained. Every act of reproduction usually creates some genetic chance peculiarity. But in the large majority of instances, the distinction is of no consequence and it gets lost in interbreeding. Occasionally, the difference is of material advantage to survival or procreation and then the difference would persist and continue, through natural selection. Such growth of new species adds to biodiversity and ensures the dynamic balance that maintains vast networks of species even as natural conditions vary and change. But there are conditions to be satisfied if a new species is actually to arise. A case where only the individuals with the new feature survive is really not the addition of a new species. But if both kinds continue, there would need to be some separation, so that both kinds do not interbreed and the genetic streams diverge. For instance, one kind may forage on a different nutrient or may be physically separated. Sometimes, the parts of a species that is divided by a barrier, like a mountain range or a stretch of water, go on to evolve into separate species, because of the physical ‘gene isolation’. There has been ample work on the genetic bases of such speciation, which arises from physical restraint of gene flow. But hardly any work has been done on the mechanism, called reinforcement, of natural selection directly preventing crossbreeding of the two strains of the species in the same habitat. As the 2 strains have arisen for some survival benefit, lack of reinforcement would lead to the distinction being lost or the creation of unviable hybrids, both of which are a cost to the community. In animals and insects, the mutant stream may display small but perceptible differences in odour, colours or behaviour, which could regulate mating and gene exchange. But this mechanism cannot work in the case of plants, which reproduce through pollination by external agencies. The Annual Phlox, a decorative flowering plant native of Texas but now cultivated in many places, exists as 2 streams, phlox drummondii and phlox cuspidate. When grown separately, both varieties thrive with flowers of a light periwinkle blue. But if grown together, and there is cross breeding, the offspring have flowers of intermediate colour, but in nearly in all the cases, the plants are sterile. The generation that arises from cross breeding is thus a dead end! Phlox drummondii, when grown with cuspidate, then adopts an ingenious device to avoid pollination, and gene transfer, across species – it develops flowers that are red in colour! As individual butterflies that visit these flowers appear to have a preference, either for blue or red flowers, cross pollination actually occurs only between similar coloured flowers and the strains stay separate. 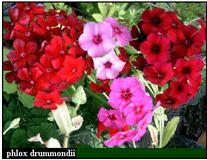 As hybrids are usually sterile, there is powerful natural selection to maintain the colour difference in p. drummondii, when it breeds along with p. cuspidate. This remarkable mechanism of ‘colour coded polination’ has been known for some time, but the genetic basis for the difference in colours of flowers was not understood. In the course of collecting data in her work, Hopkins noticed that the intermediate colours of hybrid flowers were distributed according to a clear pattern, which corresponded to the ratios discovered some 150 years ago by Gregor Mendel, in his experiments with pea plants. Hopkins carried out greenhouse experiments by interbreeding the 2 varieties of phlox and found that the hybrids formed with flowers of 4 specific intermediate colours – dark blue, light blue, dark red and light red – exactly in the ratio of 9:3:3:1. This is the established ratio when a feature is controlled by a pair of genes, with one being dominant and the other recessive. The dominant gene then appears in 3 out of 4 cases, while the recessive one appears in 1 case. Thus in crossbreeding, genes in the offspring would be distributed as: 3x3=9, 3x1=3, 1x3=3 and 1x1=1. With this clue of what to look for, standard genetic methods could lead to the exact genes that were responsible – the change to red is caused by 2 genes, one recessive and the other dominant, which knock out the production of the plants one blue pigment, but allow the 2 red pigments to continue. The result is an important advance in the mechanism of evolution and maintenance of biodiversity. "It was 2 in the morning when I figured this out," she said. "I almost woke up my adviser," says Hopkins.